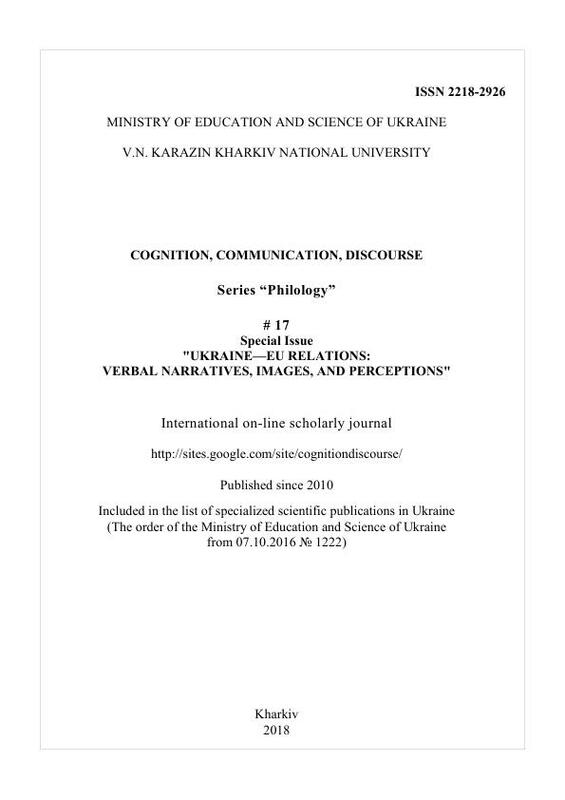 This paper aims to explore how conceptual metaphors that underlie metaphoric expressions used by Ukrainian newspapers frame the image of the European Union in Ukraine. The study is informed by conceptual metaphor theory [Lakoff & Johnson 1980, 1999], discourse metaphor theory [Musolff 2004; Cameron & Deignan 2006; Semino 2008; Musolff & Zinken 2009] and interactional narratology [Bruner 2002, 2004]. In the focus of attention are metaphoric expressions that refer to the European Union. It is argued that the metaphors under study have a powerful framing potential realized in discourse. In particular, it is maintained that in their discourse use the metaphors suggest specific metaphoric scenarios [Musolff 2006, 2016a, 2017] and in such a way articulate narratives with a certain stance. Accordingly, framing the European Union through metaphoric scenarios depends on the stance that media product creator (Ukrainian print media) takes towards the European Union, imposing it on the readership. Framing through "domesticated" metaphors provides for their better fit with the narratives circulating in the Ukrainian society in January-June 2016. Arutiunova, N.D. (1990). Metafora i diskurs [Metaphor and discourse]. (In Russian). Teorija metafory [Metaphor theory]. Moskva: Progress, 5-32. C3EU (Crisis, Conflict and Critical Diplomacy: EU Perceptions in Ukraine, Israel and Palestine). Retrieved from: https://jeanmonnet.nz/c3eu/. Cataldo, S. (2017). Cognitive politics: a communications workbook for progressives. The USA: Cross Partisan Press. Chaban, N., & Bain, J. (2014). Framing the EU in a time of crisis: media reflections from EU ‘strategic’ partners in Asia-Pacific. In N. Chaban & M. Holland (Eds. ), Communicating Europe in times of crisis. The European Union in International Affairs Series. London: Palgrave Macmillan, 118-142. Charteris-Black, J. (2004). Analysing political speeches: Rhetoric, discourse and metaphor. Basingstoke: Palgrave Macmillan. Danilet, M., Mihai, O., & Clipa, A.M. (2017). EU's metaphorical representation in the Moldovan economic press. CES Working Papers, IX(2). 97-111. Deignan, A., Littlemore, J., & Semino, E. (2013). Figurative language, genre and register. Cambridge: Cambridge University Press. Deignan, A.H. (2017). Mappings and narrative in figurative communication. In B. Hampe (Ed. ), Metaphor: Embodied Cognition and Discourse. Cambridge: Cambridge University Press. 200-219. Du Bois, J., 2007. The stance triangle. R. Englebretson (Ed. ), Stancetaking in Discourse. Amsterdam: John Benjamins, 139-182. Eco, U. (2015). How to write a thesis. Cambridge, MA: The MIT Press. El Rafaie, E. (2014). Appearances and disappearances: A dynamic view of embodiment in Conceptual Metaphor Theory. Metaphor and the Social World, 4(1), 109-125. Gibbs R., & Cameron, L. (2008). The socio-cognitive dynamics of metaphor performance. Cognitive Systems Research, 9, 64-75. Gibbs R., Jr. (2011a). The allegorical impulse. Metaphor and Symbol, 26, 121-130. Gibbs R., Jr. (2011b). Evaluating conceptual metaphor theory. Discourse processes, 48, 529-562. Goffman, E. (1986). Frame Analysis: An Essay on the Organization of Experience. Boston: Northeastern University Press. Grady, J. (1999). A typology of motivation for conceptual metaphor: correlation vs. resemblance. In R. Gibbs, Jr., & G. Steen (Eds. ), Metaphor in cognitive linguistics. Amsterdam. The Netherlands: John Benjamins, 7-100. Gubrium, J., & Holstein, J. (2009). Analyzing narrative reality. London, UK: Sage. Hampe, B. (Ed.). (2017). Metaphor. Embodied Cognition and Discourse. Cambridge: Cambridge University Press. Hanne, M. (2014). An Introduction to the "Warring with Words" Project. In M. Hanne, W.D. Crano & J.S. Mio (Eds. ), Warring with Words. Narrative and Metaphor in Politics. Psychology Press: New York and London,1-50. Kövecses, Z. (2004). Emotion, metaphor and narrative. Book review of: Hogan, P.C. The Mind and its Stories: Narrative Universals and Human Emotion. TRENDS in Cognitive Sciences, 8(4), 154-156. Kövecses, Z. (2010). Metaphor: A Practical Introduction. Oxford, etc. : Oxford University Press. Kövecses, Z. (2017). Levels of metaphor. Cognitive linguistics, 28(2), 209-370. Lakoff, G. (2004). Don't think of an elephant! Know your values and frame the debate: The essential guide for progressives. White River Junction: Chelsea Green. Lakoff, G., & Johnson, M. (1980). Metaphors we live by. Chicago & London: The University of Chicago Press. Lakoff, G., & Turner, M. (1989). More than cool reason: A field guide to poetic metaphor. Chicago: The University of Chicago Press. Langacker, R.W. (1987). Foundations of cognitive grammar: In 2 vol. Stanford: Stanford University Press. Vol. I: Theoretical Prerequisites. Musolff, A. & Zinken, J. (Eds.). (2009). Metaphor and discourse. New York: Palgrave Macmillan. Musolff, A. (2000). Mirror images of Europe. Metaphors in the public debate about Europe in Britain and Germany. München: UDICIUM Verlag GmbH. Musolff, A. (2004). Metaphor and Political Discourse Analogical Reasoning in Debates about Europe. Houndmills, etc. : Palgrave Macmillan. Musolff, A. (2006). Metaphor Scenarios in Public Discourse. Metaphor and Symbol, 2(1), 23-38. Musolff, A. (2016a). Political Metaphor Analysis: Discourse and Scenarios. London: Bloomsbury. Musolff, A. (2016b). What can metaphor theory contribute to the study of political discourse? In M. Degani, P. Frassi & M.I. Lorenzetti, The Languages of Politics / La politique et ses langages. Newcastle upon Tyne: Cambridge Scholars Publishing, 9-28. Ricoeur, P. (1979). The human experience of time and narrative. Research in Phenomenology, 9, 17-34. Ritchie, L.D. (2010) Everybody goes down: Metaphors, stories and simulations in conversations. Metaphor and Symbol, 25, 123-143. Ruiz de Mendoza, F.J., & Galera Masegosa, A. (2014). Cognitive modeling. A linguistic perspective. Amsterdam-Philadelphia: John Benjamins. Ruiz de Mendoza, F.J., & Galera Masegosa, A. (2011). The contemporary theory of metaphor: Myths, developments and challenges. Metaphor and Symbol, 26, 1-25. Ryan, M.-L. (2005). Tellability. In D. Herman et. al. (Eds. ), Routledge Encyclopedia of Narrative Theory. London: Routledge, 589-591. Schön, D. (1979). Generative metaphor: a perspective on problem solving in social policy. A. Ortony (Ed. ), Metaphor and Thought. Cambridge, etc. : Cambridge University Press, 137-163. Yavorska, H., & Bohomolov, O. (2010). Nepevnyi obyekt bazhannya: Yevropa v ukrayinsʹkomu politychnomu dyskursi [An uncertain object of desire: Europe in Ukrainian Political Discourse]. (In Ukrainian). Kyiv: Dmytro Burago Publishing House, A. Krymskyi Institute of Oriental Studies of the National Academy of Sciences, Ukraine. Zhabotynska, S.A. (2018). Images of Ukraine-EU relations in conceptual metaphors of Ukrainian mass media (this issue). Zhabotynskaya, S.A. (2013a). Imia kak tekst: kontsepualnaya set leksicheskogo znacheniya (analiz imeni emotsiji [The name as a text: conceptual network of lexical meaning (analysis of the name of emotion)]. (In Russian). Cognition, Communication, Discourse, 6, 47-76. Zhabotynskaya, S.A. (2013b). Kontseptualnaya metafora: kongruentnoye i nekongruentnoye kartirovanije vo mnozhestvennyh dannyh [Conceptual metaphor: congruent and incongruent mapping in multiple data]. (In Russian). Funktsionalnaya lingvistika, 5, 104-106. Zinken, J., Hellsten, I., & Nerlich, B. (2008). Discourse metaphors. In R. Frank & T. Dirven (Eds. ), Body, Language and Mind. Berlin and New York: Mouton de Gruyer, 363-385. The authors reserve the copyright of their work and transfer to the magazine the right of the first publication of this work under the terms of the Creative Commons Attribution NonCommercial License, which allows other persons to freely distribute a published work with mandatory reference to the authors of the original work and the first publication of the work in this journal. Authors have the right to enter into separate additional agreements for the non-exclusive dissemination of the work in the form in which it was published by this journal (for example, to post the work in the electronic institutions' repository or to publish as part of a monograph), provided that the link to the first publication of the work in this journal is given. The journal policy allows and encourages the authors to place the manuscripts on the Internet (for example, in the institutions' repositories or on personal websites), both before the presentation of this manuscript to the editorial board and during review procedure, as it contributes to the creation of productive scientific discussion and positively affects the efficiency and dynamics of citing the published work (see The Effect of Open Access).